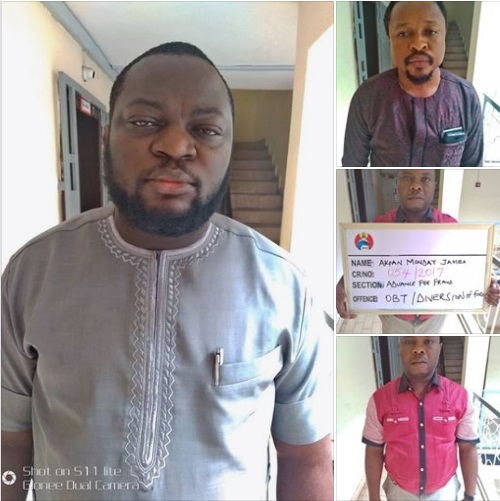 Men of the Economic and Financial Crimes Commission have arraigned some suspected fraudsters in Delta. One of the counts reads: “That you, Akpan Monday James on or about the 29 November, 2016 in Warri, within the jurisdiction of the Federal High Court of Nigeria , fraudulently converts to your own use the sum of Ten Million Naira (N10,000,000) only property of Africa Alpha Realization and thereby committed on offence punishable under section 390 of the criminal code Act , Laws of the Federation of Nigeria, C38,2004. One of the counts reads: “That you, Osaki Harry, David Woluchem and Big Ideas Galleria Ltd on or about 18 August 2017 in Warri, Delta State within the jurisdiction of this honourable court did with intent to defraud induce Olufemi Talabi of Fota Energy Limited to deposit the aggregate sum of N7,550,000.00 only into account number domicile at Zenith bank PLC operated by you with the false pretence that you have 1000,000 litres of automotive gasoline oil (AGO) to supply him which pretence you knew to be false and thereby committed an offence contrary to section 1(1) b of the Advance Fee Fraud and other fraud related offences Act 2006 and punishable under section 1(3) of the same Act.